Fellow Steampunks, I have such a special treat for you on today’s Steampunk Spotlight. 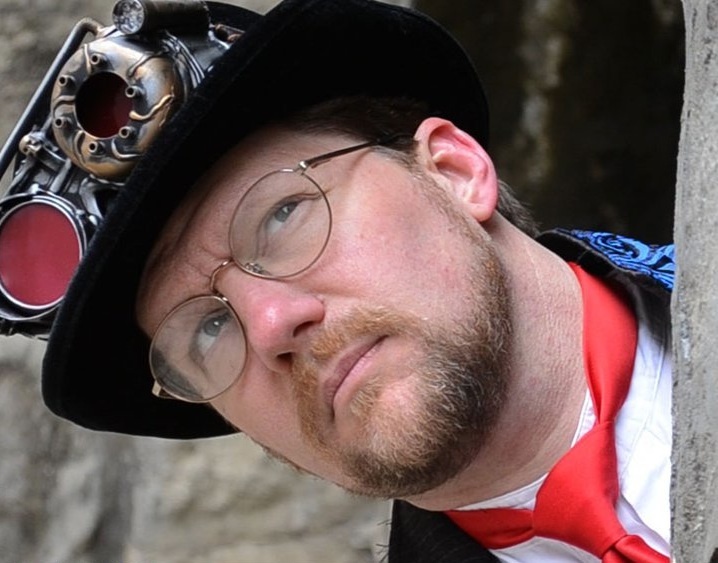 The dapper and debonair Tee Morris talks about Steampunk, promotion, and his brand new book (released today) Phoenix Rising. He is so very charming, plus he calls me lovely and delicious, which is simply scrumptious. Gentle reader, it may not come as a surprise to you that the lovely and delicious O.M. Grey has invited me to talk about steampunk as Phoenix Rising: A Ministry of Peculiar Occurrences Novel hits the stands today, across the United States. 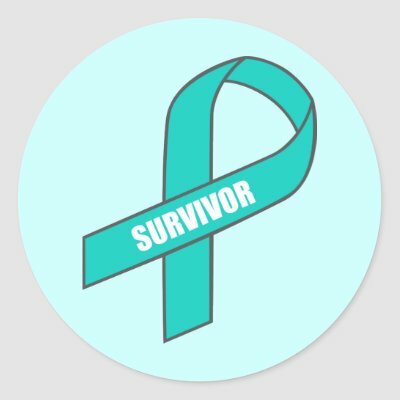 Olivia has been most gracious with her ties in the community, talking up the title on her blog, Facebook, and Twitter; and it was her own enthusiasm for it and for the genre that played a part in bringing her into the Ministry’s podcast anthology Tales from the Archives. Truly, this is community and networking all fitting in place quite comfortably like cogs in the machine, as well as validation in the efforts you as an artist put forth into building a community and establishing a reputation there in. So when people ask me what advice I have for them as an artisan — for it doesn’t matter if you are a writer, a musician, or a costumer — I encourage them to build a community around their work and then, come promotion time, make sure to reach to them for support. And then, go beyond. Go beyond? Whatever do I mean by that? Just last week, I had the good fortune to appear on the Romantic Times Book Reviews blog. Now, in all fairness, I was surprised — pleasantly, mind you — that RT reached out to the Ministry for a blogpost. While there is a bit of sexual tension (for fun, or course!) thrown into our Victorian world of the fantastic and fascinating, I would have never thought of the RT as a possible stop on the Ministry’s blog tour. I also would have never imagined such a positive reply from them on my submitted article. This opportunity, though, reinforces a strategy that Pip and I undertook when we began the promotions machine for Phoenix Rising: Reach beyond our community. Pip and I are “names” in the podcasting community. I am the first podcaster to podcast novel length fiction (an honor I share with Scott Sigler and Mark Jeffrey, all three of us who began our endeavors around the same time, and laid the groundwork for Podiobooks.com), one of the authors of Podcasting for Dummies, and a Parsec winner for my podcast of Billibub Baddings and The Case of the Singing Sword. Pip is New Zealand’s first podcast novelist, a Sir Julius Vogel winner for her podcast of Chasing the Bard, and producer of the Fantasy podcast anthology Chronicles of the Order and co-producer of Tales from the Archives. We also lend our voices to many audio productions, so the podcasting communities know us. After years of building that platform, we turned to them for support in getting the world out for Tales as well as Phoenix Rising. The podcasting community stepped up, and now those circles know of today’s release. But what about the steampunk community? We are still unknowns there. We needed to do a little bit of research, look beyond the podcasters we have known for years, and introduce ourselves. True, it can be nerve-wrecking (No one likes to be told “No, thank you. We are not interested in promoting an author’s work.”), but without the effort, you are left with “What if’s” in people you should have or could have reached out to with an introduction. One thing to keep in mind when reaching out to other steampunk venues: This community is incredibly polite. It wouldn’t surprise me at all if these people blogged in bowlers, bonnets, and bloomers, and sipped tea while they blogged. 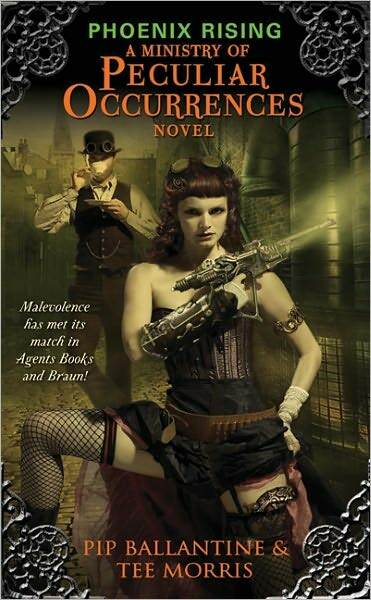 Nice people, these steampunks; and I’m proud to be offering a light-hearted romp for their pleasure. Pip and I then ventured out further. We put together a book trailer, a book trailer that found it way on this blog and a few book review blogs. Then, with the help of our publisher, we extended introduction to other bloggers and podcasters that we wouldn’t have expected: Paranormal Romance, Fantasy, Science Fiction, and even Tech and History. Some said yes, some said no. The aim we had was not to overwhelm the blogosphere or podosphere with queries, but to spread our wings and not only promote our book but promote the steampunk movement as well. 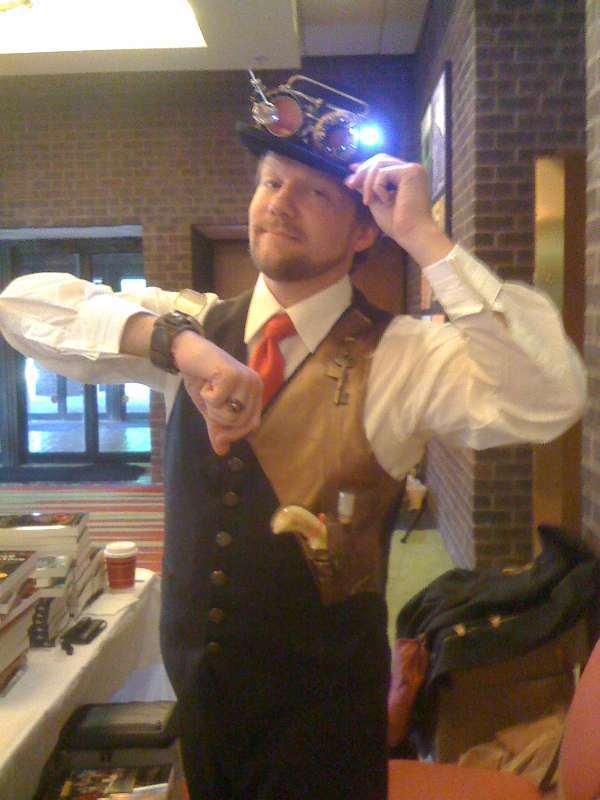 People have a variety of ideas as to what is steampunk. Pip and I look at this promotional tour as an opportunity, much like with Romantic Times, to introduce to curious people this wonderful world we reside in. So, gentle reader, my own bit of steampunkery for you on the day of our book’s release is to challenge yourself and adopt for your next project a true discipline of the Victorian age: Go beyond. In our Victorian-based/inspired fiction, we write of magnificent gentlemen in flying machines, explorers crossing and conquering new frontiers, and adventures of discovery. This is all part of the steampunk way. Therefore, go beyond. Find out if your latest creation — a short story, a film, or work of art — crosses into another interest such as romance, history, sculpture, or science. 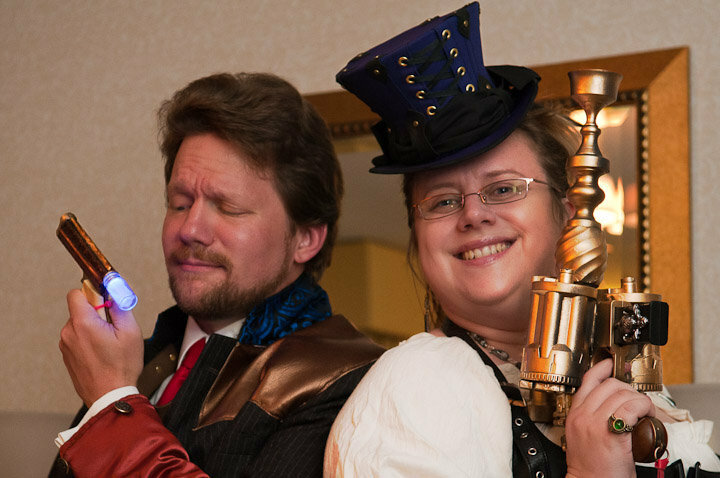 You may find yourself an ambassador of the genre, answering questions and bringing in new fans to what we do with steam, cog, and the imagination. Go beyond, for your latest creation might very well serve as another’s passport into a voyage of the fantastique. Tee Morris began his writing career with his 2002 historical epic fantasy, MOREVI The Chronicles of Rafe & Askana. In 2005 Tee took MOREVI into the then-unknown podosphere, making his novel the first book podcast in its entirety. That experience led to the founding of Podiobooks.com and collaborating with Evo Terra and Chuck Tomasi on Podcasting for Dummies. He won acclaim and accolades for his cross-genre fantasy-detective Billibub Baddings Mysteries, the podcast of The Case of the Singing Sword winning him the 2008 Parsec Award for Best Audio Drama. Phoenix Rising: A Ministry of Peculiar Occurrences Novel, co-written with Pip Ballantine, is his first steampunk offering. When he is not writing, Tee enjoys life in Virginia alongside Pip, his daughter, and five cats (3 female, 2 males). Considering the male-to-female ratio in his house, Tee understands how General Custer felt near his end. ~ by omgrey on April 26, 2011.